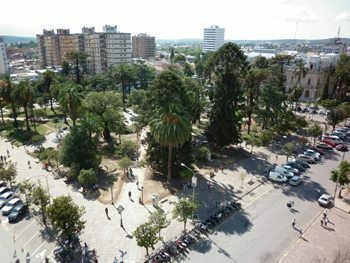 Salta, Argentina, at the far north of the country. Lydia Carey photos. Visiting a cemetery during the day is always an eery experience, especially when a northeasterly wind is whipping your sweater from your fingertips and sneaking down your collar. And yet, that is exactly what we were doing the first day of our five-day tour through Argentina's northeastern Salta province. We weren't the only ones at the cemetery that day. Néstor and a friend were building a tomb for his father, who had passed away six months earlier and was buried in town. Ever since his death, Néstor's mother had been pushing him to fulfill his father's wish to be buried where he could look out over the Lerma Valley, a strip of green amidst high-altitude, gray and coral-colored mountains. This tiny plot of land has served as a cemetery to the surrounding communities for the past 50 years and on funeral days neighbors come from miles around to pay their respects. Its colorful plastic flowers and whitewashed crosses were a small trace of humankind on an otherwise vacant, rocky highway that would take us up 3,348 meters by end of the day – to one of Argentina's highest lookouts. Our trip through the city of Salta had been brief, a quick overnight stay tinged with the anxiety and anticipation that was filling Salta's streets. Police had been striking all over the country for the last week and looters had taken advantage of the lack of surveillance to steal from shop owners. The strikes were ending as we were leaving town, but the atmosphere was one of a tense ghost town with saloon doors swinging in the breeze. We weren't much interested in hanging out in town anyways. Living in Mexico City was making us weary of city life and we were looking for some desert and sunshine. We reached Piedra del Molino (that 3,348 meter overlook I was telling you about) around mid-day, took a moment to investigate its fog-covered chapel with cigarettes and coca leaves scattered inside and bundling up against the cold wind, started to slowly descend into the Sierra de Apacheta and Los Cardones National Park. 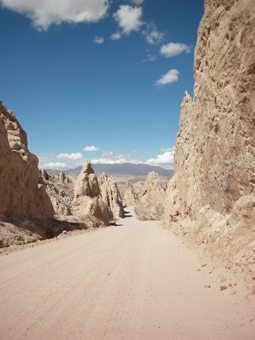 As we turned off the main road in search of the Colomé winery (which had a solitary sign in the middle of the desert), the landscape that met us was otherworldly – sun-burnt red rocks, dunes reminiscent of the surface of Mars and a soundless, sacred abandonment. Deep centuries-dry ravines cut through the park, and miles of orange cliffs were interrupted only by the fork tong-arms of Cardones cacti. We drove for hours, marveling at the wild desert around us, until we reached the Colomé Vneyards, which were, of course, closed by the time we got there. 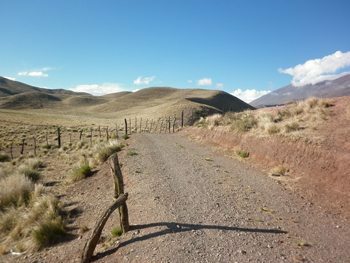 We decided to head back towards Cachi where we would would be staying at MiraLuna. This wine lodge is a collection of 12 beautiful wooden cabins just outside of town surrounded by a vineyard which produces a mere 7,000 bottles of Malbec each year and has incredible views of the surrounding countryside. Even though it was late when we arrived, they offered us homemade ground beef empanadas with peppers and onions and a bottle of red wine. We sat down to dinner under the stars at a tiny metal table just outside our room. Enjoying the pool at Miraluna. 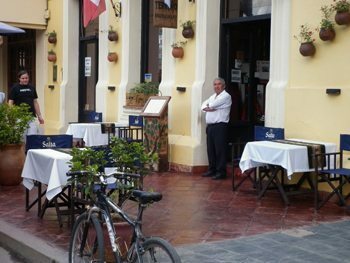 Cachi is a sleepy little place where during siesta hour or after 9pm not much happens. We wandered into town one afternoon and sampled some local wines – El Molino de Cachi and Viñas de Payogasta – and ate some Berejena al escabeche (pickled eggplant) and quinoa omelettes with local goat cheese on top. The area grows sweet peppers, olives and almonds and has these tall, skinny cypress trees that make you feel like you are in the south of Spain. The town is also northwestern Argentina's own little Area 51. There have been several reported “visitations” by aliens and a local reporter, Antonio Zuleta, swears that the best hour to see UFOs is between 8:30 and 9pm, which is also about the time everyone's third glass of wine is poured. There are three or four local wineries in the area but my advice, from our experience, is to make a reservation – they just don't get enough traffic to be open all the time. Or wait until you get to Cafayate, this province's biggest wine-producing area.As we headed there the next day, the landscape got whiter and whiter until it was almost blinding. The mountains looked covered in a fine white dust as we wiggled our way through tiny mountain passes and watched the trickle of the Calchaquí river (it was the dry season) snake along highway 40 that we were traveling on. We stopped to pick up Norma, a nurse living in the town of Payogastilla, who needed a ride to San Carlos, where we happened to be headed. She told us all about her town of 50 inhabitants, where the nearest telephone was five kilometers up the road and where until recently it was entirely common for residents to die of respiratory diseases in the winter or the dehydration that comes from diarrhea in the summer. Norma hasthe face of a cherub and the voice of Mercedes Sosa and she was almost jovial as she told us about the trials and tribulations of living in such an isolated place. We dropped her off in the main plaza so she could catch her bus to Salta and headed to Me Echó La Burra brewery just outside of town for a little afternoon refreshment. A mountain pass in the far north. The owner of the brewery wasn't the friendliest of fellows, but his beer was delicious and we ended up looking for it everywhere we went for the rest of the trip. Me Echó la Burra makes a rubia (blonde), a roja (amber), a negra (stout) and some special edition brews, but their best by far is the Blanca de Trigo, a wheat beer with a hint of citrus, lightly hoppy and effervescent. We bought the big bottles. 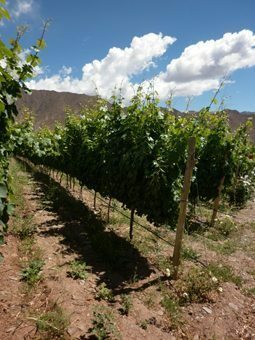 In Cafayate the grape vines spread out for miles and miles. It was a shock of green after so much desert white, gray and red and we arrived dusty and hot at the uber posh Grace Cafayate, in the middle of the Estancia Cafayate, a winery and gated community which produces wine solely for its own residents. The hotel's mountain views and enormous showers were impressive but our meal was blow-you-away-good – watermelon salad with arugula, red onion and lime, llama carpaccio and stuffed suckling pig with green-apple mash and sweet potato and bacon gratin, all complimented by the Estancia's exclusive wine collection. A sommelier explains the fine points of wine grapes. Cafayate itself is not much livelier than Cachi with a handful more restaurants and tourists ambling around. The main attraction is its wineries and on the way out of town the following day we stopped in at Piatelli (one of the few wineries open on a Sunday) and got a tour of their boutique vineyard. Jon Malinski is the vineyard's founder, an art and wine collector from Minnesota who started out in the construction business. He came to Argentina in 2000 in search of good Argentine wine and he hooked up with the Piatelli family, who have been producing wine in Mendoza since 1940. 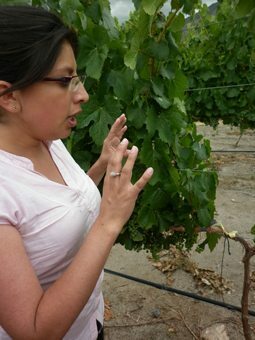 The Piatelli winery in Salta has only been open to guests since March of 2013 and so it hasn't been inundated by the crowds yet – we got our own personal tour and tasting with Jessica, one of the winery's young sommeliers, for about $10. We drove back up to Salta city – trunk full of wine and craft beer – by the eastern route (highway 68), passing a tiny town called Alemania (Germany in English) where we met Elsa, the seemingly only person in town that day, bursting with plans to open her own restaurant, in Alemania's old train station, with a loan from the government. A waiter in Cafayate, Argentina. Alemania and the station were once bustling with activity when they were the end of rail line for travelers and workers coming from Salta. Once the train stopped running, the population dwindled down to only about 50 families and Elsa is hoping her project will bring some tourism back to their dusty town. Further up the road we passed some of the fields and farmland that Argentina is famous for, along with a few tiny villages and hundreds of families picnicking on the edge of the Cabra Corral dike. Giant nativity scenes graced the rest stops and cows fearlessly ambled across the road. We entered Salta in a haze of sunset, wishing we had a few more days to explore this region of the country, but with a handful of photos and wine bottles to ease the pain of separation. Lydia Carey is a full-time writer and translator living in Mexico City. Her work has been published Luxury Latin America and in Mexico's English-language newspaper, The News and the New World Review. 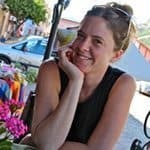 She writes a blog about life in Mexico City called Mexico City Streets.